Cinnamon is a spice that we have all had the opportunity to try, whether in fancy coffees, liqueurs or delicious buns. Whilst the “true” cinnamon species is Cinnamomum verum, the most common source of cinnamon is Cinnamomum cassia. Both species originate in Asia, with C. verum being native to Sri Lanka (formerly known as Ceylon) and C. cassia originating in southern China. In order to distinguish the cinnamon produced by the two species in the spice trade, cinnamon refers to C. verum whilst cassia refers to C. cassia. This is because, C. verum is more expensive of the two due to its sweeter taste and aroma as less than 30% of cinnamon exports come from Sri Lanka. Cinnamon has been traded for many thousands of years, with the imports into Egypt reported as early as 2000 BCE so it is no surprise that there are countless tales and historical events that surround this spice. From Sieur de Joinville believing cinnamon was fished from the Nile at the end of the world and Herodotus writing about mystical giant birds (such as a phoenix) that used cinnamon sticks to build their nests, the history of cinnamon is rich in legends of its origin as it wasn’t until 1270 that it was mentioned the spice grew in Sri Lanka. However as sweet as this spice may be it also appears to have a bloody history. Aside from the countless wars raged over the right to trade cinnamon, it was also used on the funeral pyre of Poppaea Sabina, the wife of Nero, in 65 AD. It is said that he burned over a years supply as recompense for the part he played in her death. There are a total of 5 species (C. burmannii, C. cassia, C. citriodorum, C. loureiroi and C. verum) that produce cinnamon however C. verum and C. cassia are where the majority of international commerce is sourced from. Production of cinnamon is fairly straight forward albeit time-consuming. The outer bark of the tree is shaved off exposing the inner bark which is the cinnamon layer. This inner bark is also shaved off and left to dry, naturally curling as it does. By comparison the cinnamon of C. verum has a more delicate flavour than that of C. cassia as well as having thinner bark that is more easy to crush and produces a much more smooth texture. Cinnamon is prominent in the practice of Ayurveda medicine as well as traditional Chinese medicine, being one of the 50 fundamental herbs. Traditionally it has been used to treat a wide variety of ailments from digestive problems, respiratory problems, arthritis and infections. In traditional Chinese medicine it is believed that cinnamon is able to treat these ailments through it’s ability to balance the Yin and Wei as well being a counterflow for Qi. These terms are aptly explained here for those who are interested. While there is little scientific evidence for the treatment of digestive and respiratory disorders, cinnamon does appear to possess antibacterial, antifungal and antimicrobial properties which may help to fight infections although at this moment in time it is inconclusive in studies trialled on humans. Cinnamon produced from C. cassia coumarin, which thins the blood, can be toxic to the liver in high concentrations so it is advised that only a few grams per day be consumed. For those avid tea lovers out there I’ve found instructions to brew your own cinnamon tea. Leave a comment below to tell me what you think or what you’d like to see next! This entry was posted in The Travelling Botanist, Uncategorized and tagged Ayurveda, botany, chinese medicine, Cinnamon, health, history, history of medicine, materia medica, tea, war. This blog post is going to focus on a particularly interesting plant called Papaver somniferum, more commonly known as the opium poppy. Not only does this plant have a fascinating medicinal history, it also impacted heavily on us socially. Firstly, a bit on the poppy’s medicinal use. Opium, the narcotic extracted from the plant’s seed pod, contains a number of natural painkillers and has been used in pain relief for millennia. In the 17th century, a tincture of opium combined with alcohol became readily available to the general populace under the name laudanum. Along with acting as a painkiller, laudanum was quickly employed as a cure for almost every ailment: from colds to heart problems to menstrual cramps. The drug morphine was later extracted from the opium poppy by the German pharmacist Friedrich Sertürner in the early 19th century. Morphine quickly became one of the most widely used painkillers in medicine. A further extract, called heroin, was released in 1898 by the drug company Bayer. This well known drug is now an illegal substance that is frequently abused. All of the forms of opium can be highly addictive and long term use may result in interference with the brain’s endorphin receptors. These receptors are responsible for preventing the transmission of pain signals, making withdrawal difficult. P. somniferum use predates human recorded history and has been found in Neolithic burial sites as far back as 4,200 BC. The use of opium has been documented in numerous ancient medicinal texts including the Egyptian Ebers Papyrus from 1,500BC and those by Hippocrates in 460 BC and Dioscorides in 1st century AD. One country that has played a big part in the history of opium is China, which was first introduced to P. somniferum between the 4th and 12th centuries via the trading route known as the Silk Road. By the 1600s, opium was smoked with tobacco and had become a popular pastime for the social elite. The recreational use of opium soon spread to the lower classes and its popularity soared. British traders from the East India Company sold large quantities of opium to smugglers to meet the growing demand for the drug. Worried by this, the Chinese Emperor began to take serious measurers to stop the illegal importation of opium, and in 1838 opium worth millions was destroyed by the Chinese Commissioner Lin Zexu. Since opium smuggling accounted for 15-20% of income for the British Empire, they started of the First Opium War on 18th March 1839 to combat the clampdown. The British won in 1842 and implemented a series of Unequal Treaties. The first of which, the Treaty of Nanking, involved trade concessions as well as forcing the Chinese to pay a total of 21 million ounces of silver in compensation. When Britain tried to make further demands in the 1850s, the Chinese refused and the Second Opium War began. Once again, China lost and this time was forced to legalise the opium trade. Soon opium use spread from China to the west and, as opium dens became commonplace in cities, Britain attempted to curb the use by its populace. From the 1880s onwards, they tried to reduce opium production in China by discouraging its use. However, this had the opposite effect and opium’s popularity continued to escalate. After the introduction of the more addictive heroin by Bayer, the use of opium and heroin soared even further. 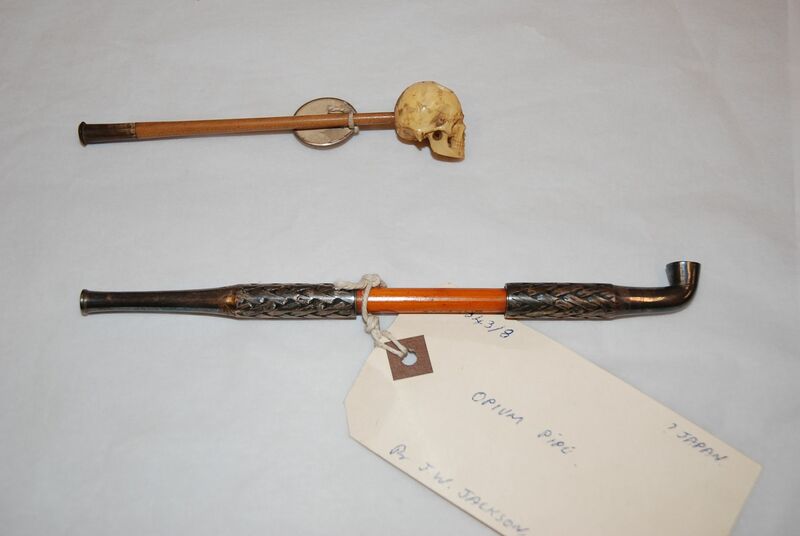 Two opium pipes in the museum’s collection. In 1906, the anti-opium initiative was set up by the Chinese to attempt to eradicate the problem. The initiative tried to turn public opinion against the drug through numerous methods, such as meetings, legal action and the requiring of licence. Opium farmers had their properties destroyed, land confiscated and sometimes publically tortured in an attempt to turn the general population against using opium. Though cruel, this method was quickly deemed a success with the majority of Chinese provinces ceasing opium production. However, this success was short-lived. By 1930, China had become the primary source of opium in Eastern Asia. Today it is estimated that 27 million people are addicted to opiates in one form or another and heroin continues to be a widely abused drug across the world. 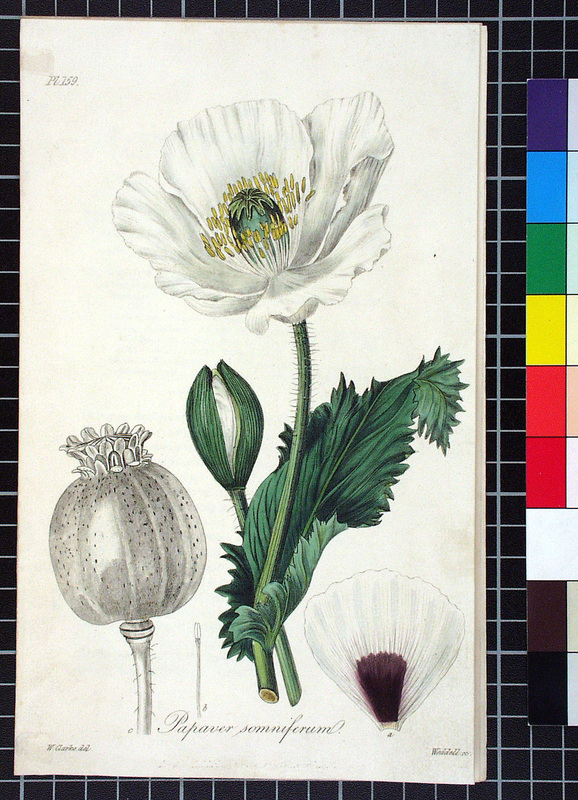 Despite its chequered past and uses, the opium poppy has still contributed greatly to modern medicine and produces one of the most widely used painkillers today: morphine. 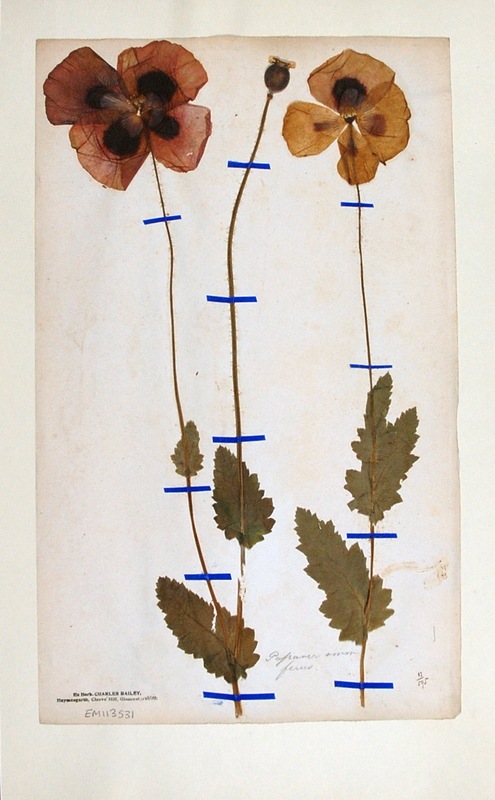 This entry was posted in Materia Medica, Specimen of the Day, Students and tagged herbarium sheet, history, materia medica, medicine, morphine, museum collection, opium, pipe, poppy, war.